Java provides many convenient wrapper classes for reading and writing data into files e.g. you can use PrintWriter to write data line by line into the file. It's println() method automatically adds line separator after each line. Java 7 has also introduced even a brand new API known as new File API, which provides powerful methods to read the whole file in just one line. All in all, Java has got really good support to deal with files in Java and we will explore more of them in coming tutorials. 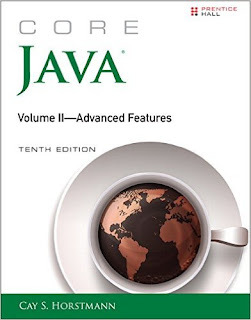 By the way, if you are a beginner and just started learning Java, I would recommend you to at least read one Java book to get a complete overview, later you can fine tune your knowledge by reading tutorials. You can refer Java: A Beginner's Guide by Herbert Schildt to start with Java. This book contains very good example and comprehensive theory and most important it's up-to-date and covers even Java 8. Here is our sample program to write data into a file in Java. In this program, we are writing String to file using FileWriter and BufferedWrite class. I have not used PrintWriter just to demonstrate how to add line separator in Java, but this makes my code platform dependent because the different platform has different line separator e.g. in Windows line separator is \n but in UNIX-like system e.g. Linux line separator is \r\n. In this example, we open a file called names.txt, remember we are not creating a file here we are just opening an existing file in current directory. If file would not be there then our code will throw FileNotFoundException. This is a little bit tricky but in Java new file is created using File.createFile() method and now by using new File() constructor. The File instance actually represents a path in the file system and that's why Java 7 has introduced a new class called Path which is equivalent to java.io.File of Java SE 6. When you use FileWriter to write into the file it uses default character encoding of the platform, which may not be what you want. If that's the case then use OutputStreamReader to provide custom character encoding. Anyway, once you have a FileWriter pointing to a file you are all set to write data into a file, but if you want to write large text then it's better to wrap this FileWriter inside a BufferedWriter. This is actually implemented using Decorator pattern because you add new functionality using composition without modifying existing classes. Next, we use write() method of BufferdWriter class to write text data into a file. Once we are done we close the file using close() method. This will release the file handles acquired by our code. See Core Java Volume 2 - Advanced Features by Cay S. Horstmann to learn more about IO classes in Java. He is the author of a couple of really useful books on Java Programming including Java SE 8. If you are running in Java 1.7 then you can use automatic resource management feature to automatically close opened resources in Java e.g. FileWriter, BufferedWriter all would have closed as soon as you exist try block. 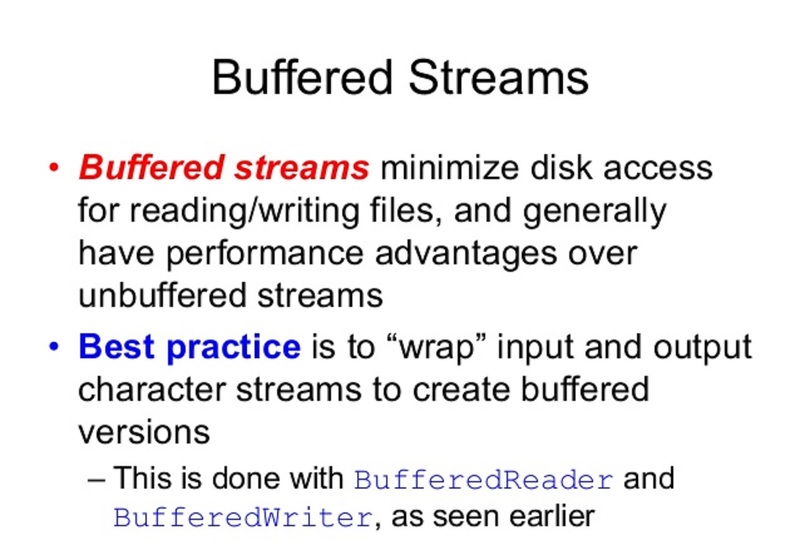 * How to write to a file in Java using BufferedReader. 1) Use FileWriter class if you want to read a text file in platform's default character encoding, otherwise use OutputStreamWriter to provide custom character encoding. Also, use FileOutputStream if you want to write bytes to file in Java. 2) Use BufferedWriter to write large text, it's more efficient that writing one byte at a time. This is actually much better than inserting line separator by yourself. It's platform independent because Java will automatically identify correct line separator depending upon where you are running this program. Inserting \n or \r\n is fragile and will not work across all platform. 4) Make sure to close the file and BufferedWriter once you are done with writing into the file. You can also use a try-with-resource statement from Java 7 to automatically close the file. That's all about how to write data to a File in Java. You can write any data type of filing by using respective write method from DataInputStream class e.g. writeInteger() to write int, writeUTF() to write String etc. 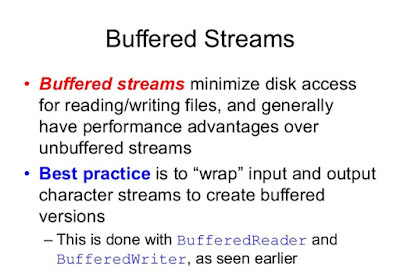 In this example, we have only written String to file using BufferedWriter. You can even wrap BufferedWriter to PrintWriter to conveniently write line by line into the file in Java by using popular methods like print() and println(). As I said if you are just starting with Java then it's better to follow one good book and finish it from start to end. This will build your base and you will learn a lot more in a short time. Once you have that base built you can explore more about individual feature of Java. You can choose any of following book to start your journey with Java.